Witty and innovative, intelligent and consequential contemporary music that challenges and refreshes. Gathered for a recent Pop-Up Concert at Columbia University’s Miller Theatre was the regular crowd: from toddler to octogenarian, from dapperly professorial to down-and-out, from serious students to funky local neighbors, all were assembled to hear whatever musical surprises the evening’s bill might offer. 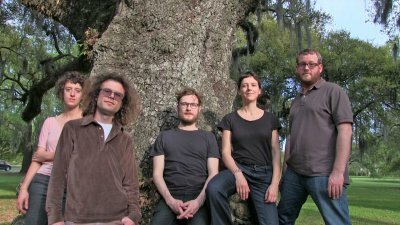 And Ensemble Pamplemousse, an exciting and distinctive six-member “composer performer collective” founded in 2003, and performing at Miller Theatre for the first time, had all sorts of fine surprises to offer. Each of the musicians composes and performs; each seems able to play several traditional and non-traditional instruments, though their publicity material identifies one primary instrument of each. All six, fresh off their extensive recent European tour – Natacha Diels/flutes, Jessie Marino/cello, Andrew Greenwald/drums, David Broome/keys, Bryan Jacobs/electronics and Ross Karre/miniature drumset – contributed equally to their recent Pop-Up performance. The opening piece, RotBlau, conceived by Marino and presented by Marino and Diels, set both the tone and the overall project of the Pamplemousse performance. Traditional features of musical excellence – virtuosic control, technical security and generous invitation into aesthetic engagement – were partnered with teetering weirdness of instrument and sound: the two musicians tapped, thumped, rolled and caressed their heavy-duty industrial work-gloved hands against the plastic cafeteria-style table they sat behind. Costumed in black, each musician wore a neon-bright fake-hair wig, one bright red to match the red latex interior of her work gloves and the other blue to match the blue latex of hers. Sometimes, Marino and Diels made sounds (designed to evoke human singing) like tribble or teletubby malfunctions that conveyed every semblance of linguistic intelligibility. On occasion, some deft sleight of hand made the blue performer red and the red, blue, and they briefly housed red and blue lights in their mouths. The visual vocabulary was Guignol’s, transplanted to – or, depending on your point of view, from – another planet. RotBlau’s systematic, unexpected and fluid inversion of seriousness and play, cerebral discipline and goofy delight in the absurd was produced by mouth sounds and table-playing that were perfectly coordinated; the glove-drumming was virtuosic. The next piece, Diels’ 2005 Ether, featuring amplified piccolo and recorded musical sounds, was dense and ornate; it was hypnotizingly tightly wound, propelled forward by a quixotic, compact jazz pulse that, at the end, expanded into airy spaciousness. Live and recorded music existed in constant close relationships – something more like wrestle and tussle than conversation or dialogue – in tight configurations of repetitions, rounds, imitations and confrontations. David Broome’s 2014 Ominousty, scored as a frenzied electronic deconstruction of Billy Joel’s 1978 “Honesty,” is a wild ride. Opening with what will by the end have been a level-headedly undisconcerting experimentation on various recorded “Honesty”-tune segments, played back at different speeds, the piece travels fast into complete high-smarts goofiness: strapped in to the listening experience by the sheer roller-coaster intensity of the sound, we listeners receive the weird offerings of an electrified Dr. Musical Mesmer and then find ourselves, at the end of the experience, exhausted, exhilarated, dazed and giddy. Organic Synthesis, written in 2015, by Bryan Jacobs was the newest piece on the program; it was presented on a combination of traditional instruments such as cello and modified drum kit and two exceptionally DIY computer controlled slide-whistles, featuring thick clear plastic tubing that required large-capacity and prodigious breath control for successful performance. The sound created was high and wild, shrill, unnerving, avian and other-planetary; this strange music was a desperate creature screech, a call whose meaning was both a plea for release and a distress lure into fascinating danger. What initially presented itself as cacophony evolved into patterns of sound and rhythm that were ornate and thrilling; every once in a while, particular noises evoked familiar phenomena such as bird songs or train whistles so compellingly that listening became simultaneously an exercise in memory and imagination. The musically intense project of the piece – the contemplation of something organic gradually created from scattered inorganic elements – presented a constant challenge to listeners to negotiate the familiar, the unknown and their relationships to each other. The last piece of the evening was Andrew Greenwald’s A Thing is a Hole in a Thing it is Not (iv), composed in 2014. This richly evocative piece generates both beauty and intellectual engagement. Flutes and cello are played experimentally: technical elements – breathing patterns, lip positions, finger actions; bowing strategies, string tapping – are separated out as though to examine a mosaic’s pieces of glass rather than the assembled whole. The music was paced out in bursts of intensity, flurries of movement, alternating with pause and silences made meaningful by their surrounding contexts; in the end, intelligibility emerged from mystery. The title of the piece is taken from writing by American sculptor Carl Andre (b. 1935); Andre’s works in various media examine the ways in which decisions about placement of commonplace elements within space control and configure meaning. A similar exploration of the ways in which being and purpose propel and inform each other exists in “Keeping Things Whole,” an early poem by Canadian-American poet and 1999 Pulitzer Prize winner Mark Strand (1934-2014): In a field/I am the absence/of field … We all have reasons/for moving./I move/to keep things whole. Greenwald’s substantive piece proved a splendid ending to a concert in which every piece offered its own special rewards. This collaborative group of composers and performers is engaged in exciting work. Each of the Pamblemoussians (as one website calls them) has an independent, full career of performing, composing, collaborating with many projects and teaching. These are serious artists; their work is grounded in careful discipline, historical context and considerable daring. Though some of their props, instruments and manipulations of electronic devices and effects have been used by other composers with outcomes that are sophomoric at best and asinine at worst, Pamplemousse’s core integrity saves their compositions from descent into mere self-indulgence: they compose with identifiable, responsible purpose and they perform with consistent artistic coherence and clarity of vision. After the performance (during which most of the audience had been sitting on the stage with the performers), several children sashayed straight up to the computer controlled slide whistles to examine them while performers and audience mingled in happy greetings and excited conversation. The children asked questions and briefly gooped around with the drums. It was an atmosphere of energetic conviviality, from which everyone then left, embarking on the rest of their evening, and thinking about what they’d just heard. First rate artists had explored questions about meaning, about the relationship between seriousness and silliness, and about traditional and non-traditional elements in contemporary music. In individual pieces, mime was made musical, outer space and inner space were inverted, organic essences were redefined, and music, enthralled, was enthralling. Wisdom and frolic do-si-do’ed. A high-energy, thrilling evening of immersion in the complex, demanding and wired music of one of America's most prolific composers.